Drive forms, are forms which can be taken by Keyblade Wielders which allow them the ability to use a specific skill set and different set of abilities through magic. Each form changes the users clothes to the appropriate color scheme and give different support and combat abilities with leanings towards each form. Certain forms are only accessible by those with certain alignments and all forms require a demonstration of the strength of the heart, and are thus only available at rank Keyblade Warrior or greater. Valor Form A form which represents the physical strength of the heart. It comes with a physical attack boost and gives combat specialized in physical attacks. 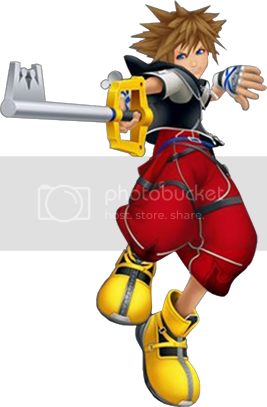 While using Valor form the Keyblade Wielder is incapable of performing normal magic attacks, and must instead rely solely on their physical prowess. This form leads to higher aggression in fighting, faster movements, higher jumps and the ability to dual wield Keyblades. When this form is unleashed the user gains a red fleur-de-lis motif. Valor Form will allow the use of 'Power Type' specific moves for the duration the form is active. Valor Form specifically gives 8 Attack Commands, 1 Action Command and 3 Support Abilities, if your character is allowed extra by rank, they can be filled in according to your tastes. Brave Shot - Unleashes a powerful finishing combo move and knocks a single target off its feet. Brave Beat - Unleashes a powerful finishing combo move that successively attack several targets at once. Sonic Strike - Unleashes a powerful finishing combo move that pierces through a single target. Sonic End - Unleashes a powerful finishing combo move in a rapid midair attack to several targets at once. Over the Horizon - Leaps towards a target in a rapid attack. Omega Finale - Deals finishing combo moves in the middle of a combo. Retaliating Slash - It allows the user to regain their balance and attack after being knocked down. Auto Valor - It allows the user to quickly activate Valor Form when in a pinch (at low health). High Jump - It allows the user to jump higher than normal, typically incorporating an aerial somersault into the jump. Sync Blade - Equips a Keyblade in each hand. The ability of the left hand weapon becomes available as well. Combo Plus - Increases maximum combo by 1 when on the ground. Air Combo Plus - Increases maximum combo by 1 when in midair. Wisdom Form A form which represents the magical strength of an individual. It is represented by a blue flame, and changes clothing to a blue and black flame pattern. While using this form one gains the ability to float above the ground freely and shoot off magical abilities. This form focuses distant combat forcing the user to shoot off rapid (weaker) magical blasts, but with a great deal of focus and accuracy. It also increases the freedom of movement and thus defense because it allows one to easily dodge in any direction at a moments notice. It also allows the freedom to perform commands even while moving. This form allows the use of magical abilities for the duration of the form, even if the Keyblade Wielder doesn't normally specialize in magic. This form comes with 6 Attack Commands, 1 Action Command and 4 Support Abilities. Any extra slots, obtained through rank can be determined by the user (so long as they are of the magical persuasion). Wisdom Shot - Changes the command Attack to Shoot. Mobile Action - Actions will be enabled while moving. Magic Haste - Shortens magic casting time and enables rapid magic combos. Magic Spice - Powers up the finishing move of magic combos. Retaliating Slash - When knocked down, quickly regains balance and counterattacks. Auto Wisdom - It allows the user to quickly activate Wisdom Form when in a pinch (at low health). Quick Run - An ability which allows the wielder to perform an aerial dash at ground level with devastating speed. MP Hastega - Increases MP restoration speed by 75% after MP is fully consumed. Combo Plus - It extends the user's ground attack combo by one additional attack. MP Rage - Restores MP relative to the amount of damage taken. MP Haste - Increases MP restoration speed by 25% after MP is fully consumed. Master Form A balanced form which demonstrates mastery of both Valor and Wisdom. 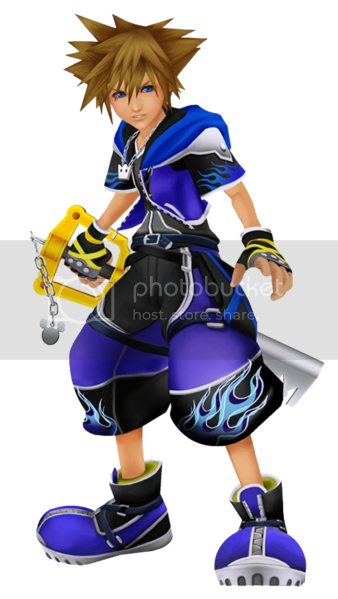 It allows one to wield two Keyblades, one physically and one through telekinesis. It also grants faster movement speed and bolsters to magic, finishing combos with crowd control effects and constantly raising the Keyblade Wielder further and further into the air, leading one to believe that this form was meant to specialize in aerial combat. It changes the wielders clothes to a bright yellow color complete with saltire motif. It also provides no basic attack as all attacks are performed in the air. It comes with 4 Attack Commands, 1 Action Command and 4 Support Abilities. The rest can be supplemented with form appropriate commands. Master Strike - Unleashes a powerful finishing combo move that successively attacks a single target. Master Magic - Powers up magic. Disaster - Unleashes a powerful finishing combo move that draws in several enemies and successively deals damage. Auto Master - It allows the user to quickly activate Master Form when in a pinch. Aerial Dodge - It allows the user to perform a spinning midair jump to evade attacks. Endless Magic - Unleashes magic combos endlessly. MP Hastera - Greatly increases MP restoration speed after MP is fully consumed. Drive forms which are the ultimate in some form or another. These have very specific triggering conditions and requirements of the Wielders who obtain them, but using them grants great benefits. Final Form A form which represents completion. It is the pinnacle form that can be taken by those who possess and have mastered the previous drive forms and thus have finished themselves. This form is meant to be the ultimate fighting form. 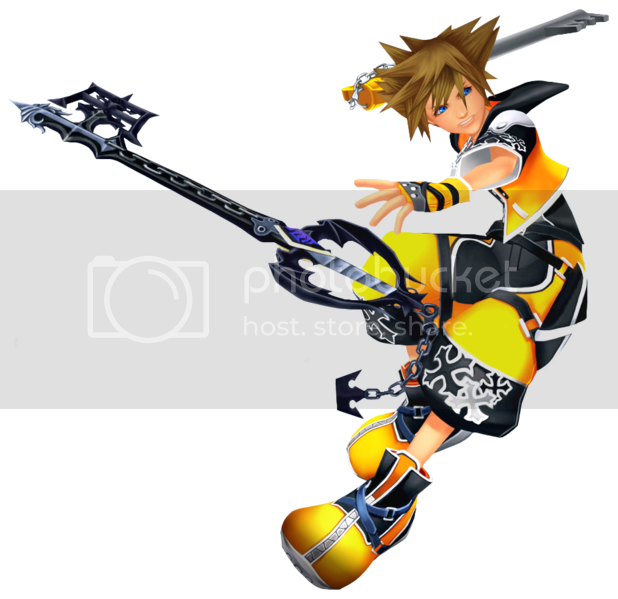 Each movement is an attack, every small motion of the arms or legs causes two telekinetically controlled Keyblades to strike out as if they are moving of their own accord. Turning the user into a living weapon, but requires harmony with all aspects of one's self. This form is marked by a white, silver and black color scheme and a white wave insignia. In this form the wielder's feet never touch the round even when they force a jump. This form comes with 6 Attack Commands, 1 Action Command, and 3 Support Abilities. The rest (if they are available) may be filled in at the discretion of the wielder. (You must be a Keyblade Master to use this form). Final Arcana - Handling the Keyblade with great skill, unleashes a powerful finishing combo move to a single target. Final Strike - While spinning in midair, deals a powerful finishing combo move to a single target. Final Arts - Unleashes a powerful finishing combo move to get rid of several targets at once. Auto Assault - The Keyblade automatically unleashes attacks in various situations. 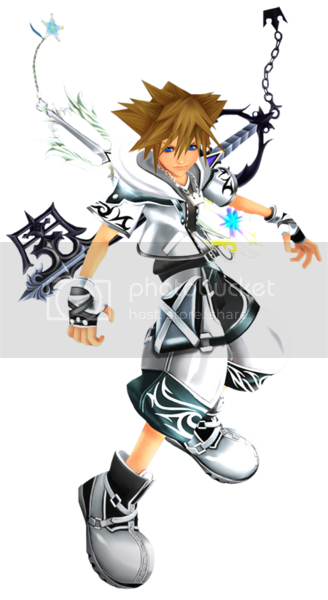 Crime & Punishment - A Keyblade held in each hand unleashes powerful magic spells. Auto Final - It allows the user to quickly activate Final Form when in a pinch (at low health). Glide - It allows the user to ride the wind and travel over distances in the air. It can be used as a faster mode of transportation than running, or as an evasion technique. Form Boost - It increases the duration of the user's Drive Forms, slowing down the consumption of energy. MP Haste - MP recharges at 1.25 times the original speed. Limit Form A form which represents and acceptance and acknowledgement of one's past. It creates a collage of moves and skills complete with a power boost. These skills mimic one's knowledge and give a diversity to the attacks one is capable of as well as allowing for one to move as if they are unhindered by the weight of their past. This form is embodied by the Silver Crown emblem and changes the color motif of one's present outfit to something they wore in the past. This kind of clear acceptance is seen only in those with a clear alignment to the Light. It consumes 14 Attack Commands, 1 Action Command and 3 Support Abilities. In order to access this ability, one must be ranked at least Keyblade Guardian. Sonic Rave - A Limit Command that unleashes an attack on an enemy as you pass by. Last Arcanum - A Limit Command that unleashes a powerful combo attack. Strike Raid - A Limit Command that allows you to throw the Keyblade at the target. Infinity - It allows the user to fire a cluster of energy shots from the tip of their Keyblade. Zantetsuken - It allows the user to execute a single, impossibly fast Keyblade strike, usually dealing a devastating amount of damage. Ripple Drive - It allows the user to unleash an aura attack that damages surrounding enemies. Hurricane Period - It allows user to spin-slash with the Keyblade 1080 degrees vertically in rapid moonsaults. Zantetsu Counter - It allows user to counter with Zantetsuken after blocking with Guard. Reflect Combo - It allows the user to block enemy attacks with Guard during a combo. Guard - It allows the user to block many frontal attacks with their weapon. Slapshot - It allows the user to execute a special attack with their weapon. Sliding Dash - It allows the user to quickly close in on a target and attack. Aerial Sweep - It allows the user to leap at an airborne enemy and strike it with a spiraling attack. Auto Limit - It allows the user to quickly activate Limit Form at low health. Dodge Roll - It allows the user to execute a forward roll, during which they are invulnerable to enemy attacks. HP Gain - It restores the user's Health with every successful hit of a Limit ability. The amount of health recovered per hit varies inversely with the number of strikes in the technique. Anti Form A form which happens as a result of trying to complete one of the other drive forms and failing at it. 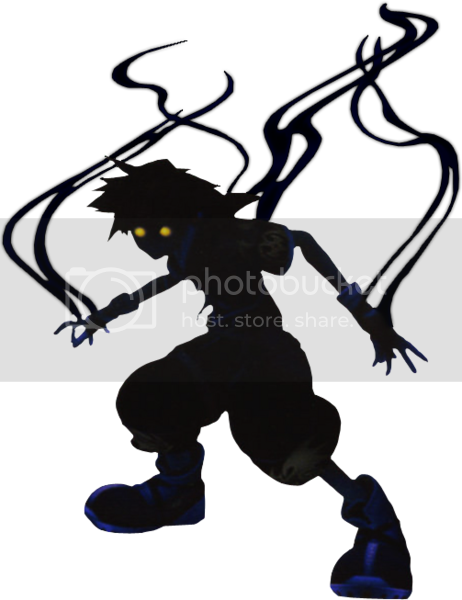 Anti form is represented by a demonic silhouette and gives the user a dark aura and ominous glow along with glowing yellow eyes. This form as animalistic and primal as a pure-blood Heartless and as such comes with a few major drawbacks. There is an inability to use the Keyblade, and all attacks are physically made with the users body. While in this form, the user will be unable to use health or recovery items, as well as being restricted from the use of spells or magic. There are no support abilities in this form, and none can be equipped. But the pure savagery of this form and its elusive movements make it comparable to a pinnicle form. Using it is usually accidental and requires you to remain in this form until the drive form trying to be used would have run out. It comes with 10 Attack Commands and 1 Action Command. Available to anyone with darkness in their house. Scratch - Automatic ground combo move. The user executes a double scratch, a rolling attack while holding their feet, finishing with a hammer-like attack with both hands. Kick Up - Automatic ground combo move. When the enemy is at long range, the user scratches and repels the enemy with an upward kick. Dance Kick - Automatic Ground combo move. When numerous enemies are nearby, the user spin-kicks repeatedly. Side Spin - User blazes in a circle around the enemy, slashing with claws and dark magic. Wild Dance - Ground combo finishing move. The user moves around the enemy and scratches repeatedly, finshing with a diving attack. Ground Flash - Ground combo finishing move. When various enemies are nearby, the user quickly scratches and repels them. Air Dance Kick - Automatic air combo move. The user kicks an enemy, then does a dash attack through them. Air Giant Wheel - Automatic air combo move. The user rapidly spins around an invisible axis, attacking with their feet. Air Wild Dance - Air combo finishing move. The user scratches an enemy and finishes with a diving attack. Mid Air Doom - Air combo finishing move. The user launches a blast of dark magic below him, hitting all enemies around. Anti Glide - It allows the user to jump backwards, spin around, and fly forward, getting behind an enemy if one is present. In addition to Drive Forms, there are some other transformations and modes that can be obtained by Keyblade wielders and other Somebodies alike. These can be related to Drive Forms, but do not require access to them at all. Dark Mode A special form available to anyone whose heart has not been overtaken by darkness, but has darkness in it. In this Form, the user can utilize their darkness without the worry of being taken over by it. However, the user's Keyblade is replaced with a Soul Eater, as the Keyblade cannot deem them worthy while their heart is in such a vulnerable state. The more darkness-oriented the user, the more this form gives them a substantial advantage in battle, such as increased speed and feeding the Soul Eater's unique power-up ability with the power of Darkness. When one activates this form, a blue aura surrounds them, and they must verbally call out to the Darkness. A bright blue light shoots out of the chest, and in a flash of light, their clothes transform into a form-fitting suit that appears to be made of black muscle tissue. The black fades to red around the wrists and comes with purple gloves that are tucked under the suit. 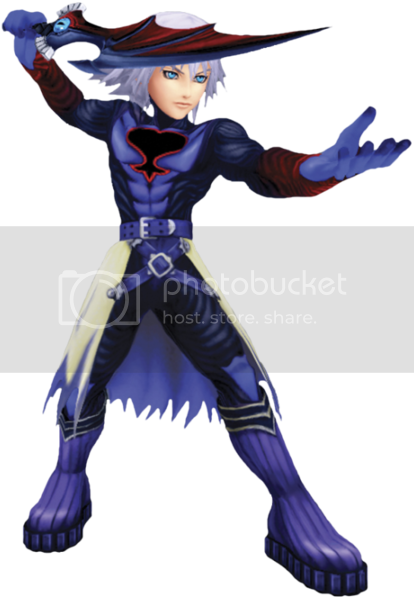 The suit has a purple-blue color on the chest and part of the torso with the Heartless emblem on the chest. It has purple feet and shins that fade into black legs. It has a dark purple belt and a cloth around the waist, opening in the front. The cloth is an off-white color that fades into dark purple and is ripped all around at the bottom. Dark Break - It allows the user to leap into the air and attack enemies from above, often dealing dark damage. Dark Firaga - Launch a ball of dark fire that blinds some targets. It inflicts more damage to enemies that are already blind. Dark Aura - It typically allows the user to rush enemies repeatedly from all directions, finishing by plunging their weapon into the ground, releasing columns of energy radially. The attack often deals dark damage. Dark Impulse - Knock foes into the air before a hard slam down to the ground, damaging multiple enemies. Dark Maelstrom - Unleash a powerful spinning attack on the enemy. Damage is concentrated to one enemy. Dark Barrage - Throw multiple Soul Eaters wrapped in darkness towards the enemy. Damage is concentrated to one enemy. Helmet Breaker - Slam the Soul Eater into the ground, emitting a shockwave stretching ahead of yourself. Dark Roll - It allows the user to dodge attacks by melting into the shadows. MP Rage - Restores Magical Power relative to the amount of damage taken. Drive Boost - It increases the power of the user's Drive Forms by focusing the power of the normal state when transforming. Auto Limit - It allows the user to activate Limit Breaks with zero charge time. Auto Healing - Automatically heal wounds at an accelerated pace. This happens at the cost of Magical Power without the user's consent. Soul Eater - The Soul Eater is a sword that grows more powerful when used with darkness, and is the developing form of the Way to the Dawn Keyblade. The Soul Eater is a falchion-esque sword, with a red, purple and blue blade shaped like a demonic wing. Its handle bears the Gazing Eye, and the handle itself consists of dark braids. It has a striking resemblance to Way to the Dawn, as well as Void Gear. The weapon can be summoned at will, appearing in the user's hand in an amorphous cloud of darkness. Corrupt Form A special form that can be considered an evolution of Dark Mode. It is unlocked when one who has accessed Dark Mode succumbs to strong, negative emotions. It grants an even more substantial increase to all abilities. 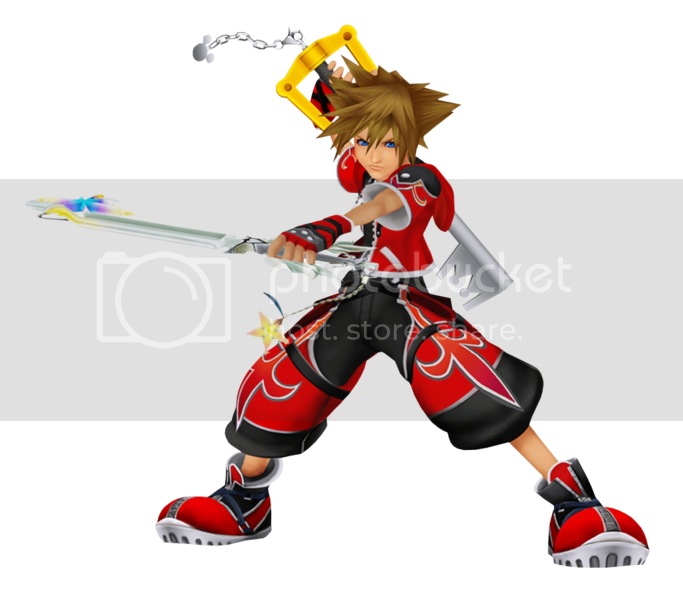 Due to the focus of one's heart during this transformation, they become able to wield a Keyblade once more. 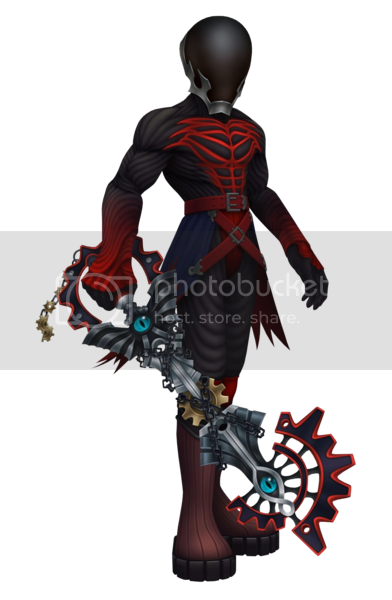 The Corrupt Form suit is colored in various shades of blacks and reds rather than blacks and violets, a distorted version of the Unversed insignia appearing on the chest rather than the Heartless insignia-like emblem that appears on the user while in Dark Mode. This form locks the user into the Dark Cannon Shotlock and the Vanitas Command Style. Shadow Dive - The user dives into the ground and homes in on the opponent. Once within range, the user reemerges as several fireballs rain down. Dark Splicer - It allows the user to stop an enemy in its tracks and teleport around them multiple times while slashing at them. Dark Spiral - The user dashes through the air at high speeds while wrapped in dark energy. Dark Fang - The user wraps the battlefield in darkness, dashes quickly, and places a row of dark crystals on either side of the opponent. These crystals rush at the opponent and inflict Blind on contact. Clone Burst - The user encases himself in a sphere of impenetrable, dark energy and launches several dark clones at the opponent before rushing forward with an attack of his/her own that inflicts Blind if it makes contact. Dark Blizzaga - A special attack that targets a single enemy. Launch a chunk of black ice that blinds some targets. It inflicts more damage of the target is stunned or paralyzed. Dark Thundaga - A special attack that targets all enemies with dark lightning. It blinds some foes and inflicts more damage the more Lux the user has on hand. Afterimage - It allows the user to quickly teleport away leaving behind a lasting afterimage. Dark Barrier - It allows the user to block attacks from any direction and blind enemies when hit. Dark Charge - It makes it so any time the user is hit, they automatically release a pulse of dark energy to repel attackers and/or whatever remains of a ranged attack on them. Form Boost - It gives the user immense stamina during Drive Forms to make them less tiring and able to be maintained indefinitely. Summon Boost - It increases the number of summons that can be called upon by one. Dark Cannon: The attack consists of the user firing a continuous laser of darkness to mow through targets. Vanitas: The Vanitas Command Style enables fast, strong attacks using darkness. It involves teleporting through shadows, and spinning the Keyblade when attacking. It also makes great use of the Dark Cannon Shotlock, and is able to trigger it at a moment's notice to eliminate foes.